‘Aspen Grove' is a beautiful luxury mountain home, professionally decorated, and fully appointed. Nestled in one of the few magical groves of Aspen trees found in Angel Fire, it backs up to an expansive green belt, which is a wilderness playground for elk and deer. The house boasts 4 fireboxes which gives it warmth with a nostalgic air and one fireplace for atmosphere in LR (plus central heat). ‘Aspen Grove’ sleeps 10 people comfortably - with two master bedrooms (one with a king bed, and one with a queen), and a spacious ‘bunk room’ which sleeps 6. All three bedrooms have a large separate bath. There’s a large kitchen which has everything you need, with all new appliances and seating for 10. This is the perfect home for gatherings of families and friends, where everyone has their own separate space. 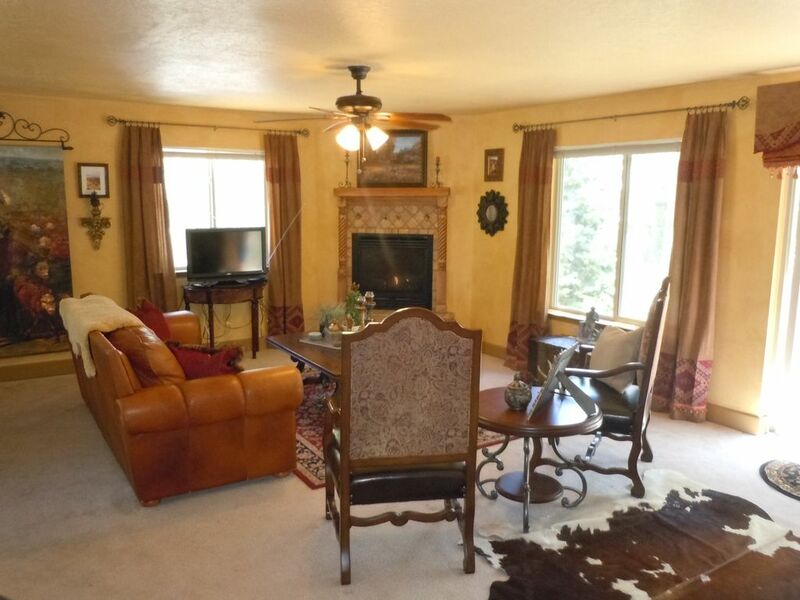 It has a heated 2 ½ car garage, on well maintained roads, with no step inclines. Great location: The brand new first class Country Club, only a mile away, has stunning panoramic views of the Sangre de Cristo mountains, gourmet fine and casual dinning, an elegant lounge with a full service bar, a full service golf shop, modern pristine fitness center, a huge sparkling indoor swimming pool, and award winning golf course. Angel Fire also offers a first rate ski mountain, fishing, hiking, horseback riding, four wheeling, spas, shopping, children's play ground, basket ball courts, tennis courts, country's highest zip line, snow shoe & cross country trails, the nation's best bmx bike trails, and lots more. Enjoy a relaxing, rejuvenating retreat you will want to repeat. Make your reservations now! Adults and kids each have their own space: Adults can congregate on the main floor in the living & dining rooms with a TV and fireplace and beautiful views, right off of the gourmet kitchen. While the children have fun on the other level in the family room with their own TV, DVD player, and an assortment of games and toys. In 2010, after being disappointed with a few places where we paid to stay, we decided to buy our own home in Angel Fire. A bright & beautiful, warm and cozy, large and well appointed home away from home that we could bring our friends and thoroughly enjoy ourselves- with NO surprises! This home is also every convenient and on level well maintained roads (unlike many homes we have seen in the mountains). Please come and and enjoy a fabulous vacation at Aspen grove! We have amazing views from every window of the beautiful aspen grove forest. The house backs up to a green belt- gorgeous and peaceful! We stayed in this house for 3 days. First of all house is old and on top of it owner didn’t maintain well. There is only one thermostat through out the house and you cannot control the temperature on the top of the house. It was very warm and kids had difficulty to sleep at nights. WiFi works only for 2-3 devices and disconnects often. Patio where the outdoor grill is there was filled with full of snow & ice. When we reached owner to clean it. She said we should bear the expenses. No gas in the grill, owner was not rechable for any issues and we filled it ourself. We cannot keep the trash outside the home and trash bins are very far away from home. There are no clear directions to throw the trash. My family of four and my friend and her family of three stayed here for 4 nights. Absolutely loved it. Plenty of room for 8-10 people. We had several mule deer in our yard a couple of nights. The owner, Kathleen, was always very quick to respond to any questions I had. Looking forward to staying here again in the future. Perfect set up for our 2 families and location to Angel Fire was nice and close. The house was nice and cozy and having the heated garage was ideal. Great location and we saw deer every day right in the yard!! Amenities were perfect...we had everything we needed. Only downfall was we couldn’t get the fireplace upstairs to come on. Also the front desk staff at the Resort told us that only guests of the hotel were allowed to use the hot tub (which we really needed after a day of skiing). We stayed for 45 days after staying a week during spring break. With two floors, and the layout of a downstairs bath, 2nd living room and bedroom with 4 bunks, this is the ideal property to have adults upstairs and children downstairs, each in their own space. Rooms are generous and kitchen is fully equipped. Angel Fire is a wonderful escape from the TX and OK summer heat and great family-friendly place to ski in the winter. Location is ideal being on the west side of Hwy 434, where roads are better, and house is at a cool 8700 ft elevation, nestled in an aspen grove. The house was great and in a great location. Close to town without being on top of the major road. A nice little get away. My children loved having their own den to sit and watch TV before bed each night. Lots of space for our family of 5. We went to Red River and Taos and spent sometime but saw nothing as nice as where we were staying but they were close enough to enjoy the activities offered. You could go right across the way to do some mountain hiking or take a nice hike through the "neighborhood". The Country Club was also nice place for entertainment. We saw lots of deer, and if you are an early riser you will see them in the yard. The house was very clean and Kathleen was very helpful and easy to get in touch with. The kitchen had all the utensils you would ever need and there was a gift of chocolate, which lasted 5 minutes, and coffee. There was also a selection of movies for rainy days. We could not have asked for a better experience. I highly recommend it!! Great family house in the mountains. Very spacious. Great for families with two distinct living spaces. Amazing views into the mountains from all over the house. Big two car garage, great for all seasons. Very fast Internet service - 5G. road in the mountains can be unpredictable and treacherous in the winter months, and chains are recommended on 2 wheel drive cars as a precaution. Monthly rates based on 28 days, or three weekends Prices subject to change No smoking property Small dogs will be considered for a $50 additional fee Your will be responsible & charged for any damages over and above the $200 damage deposit Condition of property and items (furniture & accessories) owned there in are assessed after every renter. If anything is found missing or damaged, you will be charged.